Late Glorified Easow Mar Timotheos Episcopa – a glowing morning star shined for the people of the land – was born on 25th Nov. 1932 at Thonniyamala, a tiny village about 4 kms. from Pathanamthitta. His zeal for mission made him dedicate his life for missionary work. A member of Christa Panthi Ashram for 21 years from the age of 20, he had his theological education at the Leonard Theological College, Jabalpur and later at St. Augustine College, Canterbury, UK. His life of prayer and deep spiritual experience encouraged him to engage himself in rural development activities. 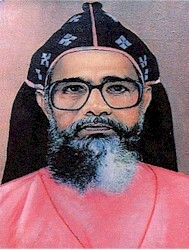 He was consecrated Bishop along with Joseph Mar Irenaeus in February 1975 and was given charge of the Kunnamkulam-Malabar diocese where he worked strenuously for the upliftment of the parishes in those under-developed areas of Malabar. The Mar Thoma College at Chungathara, which was started out of his personal interest in 1981, was instituted to facilitate higher education in Nilambur area. He gave warm support to the Wandoor Project taken up by the Christian Agency for Rural Development (CARD). As a committed person, having evangelical zeal, he helped many to find new life in Jesus. His sudden demise at Port Blair, on 11th April 1988 is a great loss to the church. Today various Bible institutes and educational institutions established in his memory ignites the evangelical zeal and educational interests of the church throughout the country and abroad.